"background : at the beach, australian beach would be good..
this is my Home Based Office!" "
The client's colleague has made an equiry on this job few weeks back. I replied him with the rate. He replied my email, asking me to proceed. And it happened that my laptop crashed on that day, and that email was not received on my end. I didn't realise it until this client called up to check with me on the status. yesterday. He got this shock of the day, upon hearing that this job was not in my work schedule, as I didn't receive that email to procxeed with this job, and I didn't receive a 50% deposit as confirmation of job. Anyway, we got this done with frame in time, and it happened that I was not that tight up these 2 days. I was rather amazed too, on the speed of delivery of job. 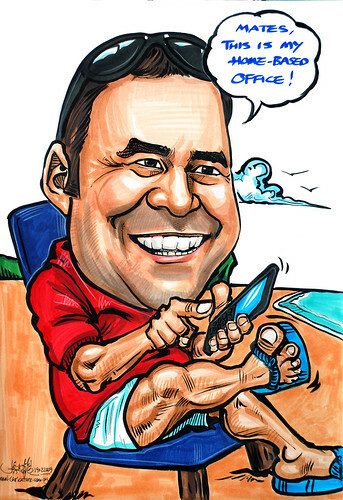 appreciated your help to get the caricature done. Everyone, especially Scott Clare, the subject person loved the rendition. He was so surprised and wondered how we managed to get the picture of him at the beach. He had one photograph taken a year back with the similar posture and background!